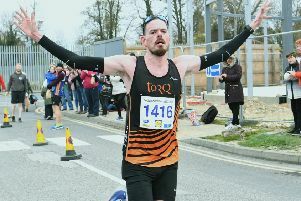 Peterborough Athletic Club’s Steve Robinson was a comfortable winner of yesterday’s (April 3) Thorney 10K race. He raced home in 33mins 17secs and that was almost a minute clear of runner-up Callum Stanforth from Ryston. He clocked 34:11 with Ben Heron from Eye Community Runners third in 34:16. Other local runners to make the top 10 out of a field of 274 runners were Phil Martin from Bushfield Joggers in seventh place in 36:25 and Steve Hall from Peterborough AC in 10th spot in 36:38. First female finisher in 21st place was Natalie Lawrence from Fairlands Valley Spartans with a time of 39:03. Lisa Marriott from Ramsey Runners was second lady in 26th place in 39:40.